Here are pictures of the recipes in the previous post from the Thanksgiving feast I shared with friends this year. The dishes consisted of kale avocado salad, jicima potatoes and gravy, veggie stuffing, succulent cranberry sauce, fall acorn squash soup, pumpkin pudding and sweet! sweet potato pie. These recipes were all delicious, easy to make and enjoyed by everyone. They're great to make for all your holiday guests... they'll never know they're vegan and raw! Included are some additional pictures of the Thanksgiving meal at our local 'Raw Friday' restaurant prepared by Chef Moon at the Blue Nile Cafe in Tempe, Arizona. The meal was outstanding and included a spicy spinach and avocado soup, side salad with tangy dressing and a Thanksgiving Platter with a rosemary veggie loaf, walnut raisin and celery stuffing, sweet and tart cranberry sauce and mashed 'potatoes'. Delicious! I'm very grateful for sharing this celebration with friends. One of the greatest gifts in life is the expression of gratitude. It not only feels good, but also brings joy and more of what you wish into your life. Try it and I'm sure you'll agree. All the best for your health and happy Thanksgiving wishes! This is a colorful and delicious italian style recipe - Raw Ratatouille! It's fast and easy to make, great for a filling fall dinner. Chop up all vegetables and put in serving bowl. In a separate bowl, add tahini, honey and celtic sea salt. Mix well. Top the vegetables with this thick and tasty dressing! Serves 2. The dressing can also be used for other dishes, including salads. Inspired by Storm and Jinjee from their Garden Diet series. 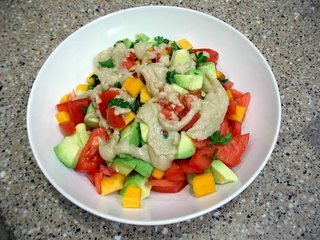 What About a 100% Raw Food Vegan Diet? Recently I noticed a lively conversation over at Kevin Gianni's Renegade Health Blog about thoughts on a complete 100% raw food diet. Kevin mentioned since he wasn't 100% raw, he couldn't comment on some aspects of the diet and invited others to share their thoughts. Being 100% raw for over 3.5 years, I thought I could share some insight. Basically, here's what I wrote.